FOR IMMEDIATE ASSISTANCE- call us at 631-563-7720 Bill Merrell of the Merrell Institute Can Help You...NOW! What's more, Bill Merrell does not plan on charging you for his time and expertise. If you are charged for additional services, you always have the option to perform these services yourself, since we are doing this to benefit the appraisal industry not create an added income stream for Bill Merrell and his affiliate companies. Bill Merrell has 3 decades of experience, starting as a Real Estate Broker, is a General Certified Appraiser, is approved by NYS to teach appraising, real estate, home inspection and is nationally certified by IDECC for Distance Learning. We wish to interview each interested party and we request you will out the documents we request below, along with all supporting documentation. We cannot guarantee we will take your case, but we can guarantee you that we will review your case and give you a realistic view of the type of difficulties you are experiencing. I am not an attorney, not do I pretend to give legal advise. I, as an educator and as a professional am willing to lend my professional experience to help those who are unable to take a step back to look at the situation logically and rationally. We also recommend you hire an attorney to protect your rights. All I can do is give you my opinion as a professional in this twenty first century environment. We have been given permission to use the jpg's on this page. In the event we are told we cannot use same we will remove them immediately. YOU MAY NOW HAVE A SOLUTION TO YOUR SITUATION. WE CAN HELP YOU TO CORRECT YOUR PROBLEM- DON'T BE A VICTIM- TAKE CONTROL OVER YOUR LIFE AND YOUR SITUATION. ACTING LIKE A VICTIM MAKES YOU A VICTIM. EMPOWER YOURSELF AND TAKE CONTROL OVER YOUR RIGHTS AND YOUR LIFE. What is the problem?-Fill everything out in detail, make sure you have all attached documents to support your case and make an appointment with Bill Merrell as soon as possible by sending us an e-mail or calling us at 631-567-6776. Bill Merrell is volunteering his time and energy to help those in need. We can only help our students as an advocate and we also have listed all the areas you can file a complaint for an appraisal that was not performed by you that has your name on it illegally. Have you filed a complaint against the person who either assumed your identity or forged your signature with the NYS, Dept of State, Division of Licensing Services? This is the web link to file a complaint with NYS, Dept. of State, Division of Licensing Services. Even if the Dept. of State is investigating you, you can still file a written complaint against the party or parties who illegally used you good name, your electronic signature, etc. in an attempt to have the appraisal in question accepted and funded by the lender. Your name was used in a criminal activity, and you owe it to yourself to make use that everyone knows the appraisal is NOT yours. Don't just react. Be proactive. Call us, we can help. Calling does NOT protect your rights, nor does it prove that you really called anyone. Always write letters, send same certified mail or make a copy of the sealed, postmarked letter showing it was submitted to the post office for delivery. If you have a question for the Dept. of State, call their general number at 518-474-4429 (to speak with a real person and bypass the automated voice mail system, when you hear the voice mail system, press the number 1 , wait 5 seconds then press the number 5. You will be switched to a real person within several minutes) They are open 9am to 4pm and closed for lunch. http://www.oag.state.ny.us/complaints/html/comp_invest.html Make sure your complaint is real, it is complete and it is understandable. You must convey your situation in a clear, concise fashion. It will go a long way to having your case considered and hopefully resolved. Click on the link to file an official complaint for Identity Theft- This is a form for you to use if your identity has been compromised! You can use this form and notify the authorities with the information contained in this report. Each county in NYS should have an identity theft division. Call and get their address and mail it to them. Be proactive. Keep copies of everything, including copies of envelopes of each document you mailed. You must document the steps you have performed to protect your good name. Click on the above form to file an official complaint regarding Identity Theft in which the US Post Office was used! If everything was done via the internet, the US Post Office is not directly involved. The minute the forged appraisal was mailed, you can file a complaint with the US Post Office and ask that they investigate this illegal activity. Be proactive. We can help. We are human. We all make mistakes. We trust people. Funny, we believe that people are honest, ethical and do things legally. If you trusted someone and were taken advantage of, you have the right to complain about what has occurred. You must protect your good name. Did someone illegally sign your name or affix your electronic signature to a legal document without your permission? Did someone change, modify or alter documents you created, which you never approved? Were you a victim of identity theft? identity fraud? electronic signature theft? If the above applies to you, you have the right to fight back. Legally fight back. Ethically fight back. When fighting back, you must notify all parties to the transaction that you are not part of this fraudulent activity. You must certifying that the activity was done with out your permission or authorization. You have the right to protect your good name and get a level of satisfaction and a level of security. Your name and your reputation has value. Protect your name and exercise your rights. I have developed a detailed 7 step program designed to protect your good name. If we take you case, there may be expenses, however Bill Merrell's time to show you how to empower yourself and not be a victim is FREE. No strings attached. I really do believe you need someone to be there to help. I hope to be that person. Don't forget, you still may need an attorney. By all means, hire an attorney to protect your rights. Let me show you what your potential options are. All documents and information you issue to me will be kept in strict confidence. You have my personal assurance that I will respect our confidentiality. Appraisers may not be this lucky. Imagine, your name and signature is attached to an appraisal. The loan closes, is funded, and 3 years later, you must prove your innocence that you had nothing to do with the appraisal. How do you prove your innocence? What if the appraiser who forged your signature doesn't want to admit to the fact that he/she committed a crime, (a serious one at that). Appraisers are finding themselves in this position, and in the event that a complaint is raised against the appraisal, the appraiser may be defending an appraisal that was never created or completed by the appraiser. How do you protect yourself against forgery and fraud? Call us and we will tell you how to protect yourself against this criminal activity. Be proactive now, and listen to what Bill Merrell has to say. The meeting is at no cost or obligation to you. Articles involving Fraud- A Good Read to help with your defense! Brian Weaver has suggested that there are three main scenarios of appraiser identity theft and forgery currently taking place. First, there is the appraiser-trainee who is fed up with splitting fees with their sponsor/ mentor and has decided to forge their mentor’s name and affix their mentor’s license number to reports without their mentor’s knowledge or permission. Second, there are appraisers who go phishing for license numbers. The term phishing refers to the current internet ploy by computer hackers to scour cyberspace for usable personal data that can be exploited. The third and most disturbing trend involves persons who never were licensed appraisers, yet find this to be their crime of choice. Like those who go phishing, they come up with almost random victims and prepare bogus reports for hefty fees. Remove your license number from your business card (if legally permissible). Remove your license number from your stationery (if legally permissible). Remove your license number(s) from your website and e-mail stamp (if legally permissible). This includes removing the actual image of your license. Remove your license number from websites that advertise your services (if legally permissible). Stop sharing your software signature codes with everyone in the office. Stop taping signature codes on the wall next to the computer at the office. Try using something a little more complex than “appraiser” for a password. Eliminate your E&O declaration page from your website. Be more circumspect about who has access to your license. I have to admit that I had been guilty of breaking almost ALL of those rules. After the article came out, I got a call from T. J. McCarthy at ICAP to advise me of the risks I was taking with having my license, resume, and E&O certificate available from my web site. After his call I took advantage of a "Password Protected Page" feature that my web host provides. This allows me to keep my private information private . . .but available to trusted clients and those that need to know. - The home builder selling extra houses during the boom making extra profits off increasingly lower quality houses. - The mortgage bankers and banks making fees off of the loans and then reselling them. Will they take the coming credit loss themselves or will they try to pass it onto the American taxpayer and not back to their shareholders like they should. Remember when you used to put down 20% on a house purchase, there was a reason for it that we will soon be asking why it was abandoned. - The publishers that made it all too easy to advertise without educating the consumers, many who had no idea what interest only or ARM meant. - Where were the reporters that write now on these subjects as if it’s new news of what drove the boom for the past five years? That silence was deafening. If you are planning on being a white collar criminal and committing mortgage fraud, this is the time to do so. Do to a lack of funding and manpower the FBI is short 2,500 agents that they previously had to investigate white collar crimes such as mortgage fraud. The demands in a post 911 world have kept the focus on investigating international terrorists and not domestic crimes. Of course the bad guys know this and that investigations of mortgage fraud are anemic. Like the war on drugs, token and high profile cases are made, but the typical case of mortgage fraud languishes in the to–do box. Combine that with non existent due diligence in lending and you are looking at 204 convictions for over 4 billion dollars worth of mortgage fraud. Dollar losses in 2006 were close to quadruple what they were in 2003 and the number of cases has increased by a similar amount, according to the FBI. As a result, while banks reported more than 59,000 mortgage-related frauds to the FBI last fiscal year, the bureau obtained only 263 indictments and 204 convictions. Meanwhile, the backlog of mortgage fraud cases under investigation has more than doubled since 2003, from 463 to more than 1,000, according to FBI figures. An FBI spokesman in Washington, D.C., said it is forming partnerships with other agencies and with groups such as the Mortgage Bankers to make up for the lack of agents it has available. “We realize that we sometimes have to do more with less,” spokesman Steve Kodak told the P-I. 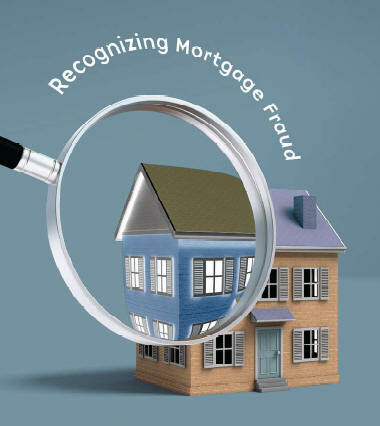 Mortgage fraud is a problem that is increasingly coming to light in the marketplace. The fraudulent data is also in the MLS data that real estate agents need to properly do their job and these distortions can hurt buyers and sellers as much as the mortgage companies. The article this morning in the Miami Herald explains why. But real estate agents say they are sometimes asked to raise the list price of a home. In mortgage fraud cases, that allows a broker to pay the seller at the original list price and keep the rest of the money as cash back at closing. The false sales information means other sellers can end up overpricing houses that then get stuck on the market, and other buyers can end up paying more than they should. ”The average person in a neighborhood full of fraud is paying higher taxes because of an artificial base — they’re paying more because somebody cheated,” says Nancy Hogan, a member of the Florida Real Estate Commission, a state licensing board that has no authority over the MLS. “On the other hand, when those houses go into foreclosure, they are also bringing down the neighborhood.” via the Miami Herald.com . With all of the fury over mortgage foreclosures, state officials across the country are putting appraisers and their inflated appraisals under the microscope. The game of nudge nudge, wink wink between appraisers and mortgage lenders has been going on for years, but with rising housing prices and easy loan money it was largely under the radar. However, now that the housing market has slowed down and some of the loans that were written with inflated appraisals are crashing and burning in foreclosure, the spotlight is firmly on the relationship between shifty mortgage brokers and suspect appraisers. Now I do not want to tar and feather either profession, but there are bad apples out there. If your choice is to “play ball” or lose a big account, many people give in to the temptation. And with little fear of repercussion many appraisers fell into the trap. However the head of the Colorado Division of Real Estate has the appraiser lender relationship firmly in her cross-hairs. And Elliot Spitzer’s successor as New York State Attorney General Andrew Cuomo is also on the hunt to highlight unethical lending and appraising practices. Attorney General Andrew Cuomo said in an interview today he has subpoenaed “many, many more’ companies. The four that have acknowledged receiving them are: Vanderbilt, New York appraiser Mitchell, Maxwell Jackson Inc., First American Corp.’s eAppraiseIT LLC and the broker Manhattan Mortgage Co. Manhattan-based Vanderbilt didn’t say what Cuomo was seeking. After you have read all the above articles, you can see that Fraud and Forgery is more common than most appraisers are even aware of. The next step is to set the record straight. You have a responsibility to make sure that the person who almost got away with stealing your identity will be held responsible for his or her actions. Call Bill Merrell today and let's see what we can do to help your cause. You are not alone! 631-563-7720. The meeting is free. Bring al your documents. We can't guarantee you that we can fix your problem. We can let you know what your potential options are. 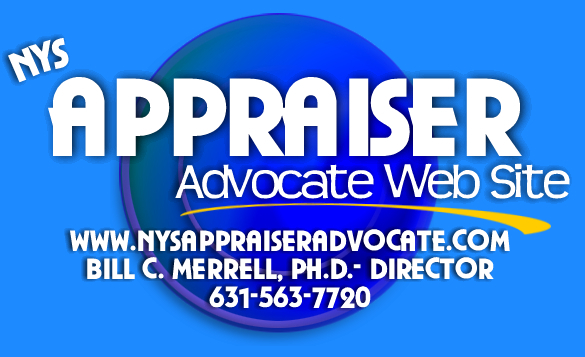 We believe you have rights and Bill Merrell has personally funded this entire operation to benefit the appraiser in NYS. Bill Merrell wants to help. Call him today. We will ask your name, address, phone number and all information in order to help. We keep all information confidential. Information is updated constantly- always check each area, and make sure you protect your rights under the law. USE OUR DATA TO BENEFIT YOUR SITUATION. IF YOU HAVE ADDITIONAL AREAS OR ADDRESSES WHICH WILL HELP OTHERS, PLEASE SEND IT TO US SO WE CAN SHARE SAME ON THIS WEB SITE- WE ARE HAPPY TO SAY THAT HUNDREDS OF PROFESSIONALS HAVE UTILIZED THIS SITE AND FILED COMPLAINTS TO PROTECT THEIR GOOD NAME- WE ARE MAKING A DIFFERENCE, ONE CASE OF IDENTITY THEFT AND FRAUD AT A TIME! CALL ME, BILL MERRELL AT 631-563-7720 IF YOU HAVE A SERIOUS, CONFIDENTIAL SITUATION YOU WISH TO DISCUSS!